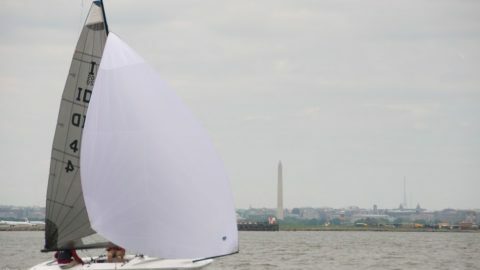 The Potomac River (PO) Inland 20 fleet announces the Potomac River Inland 20 Scow Fleet Cherry Blossom Regatta. 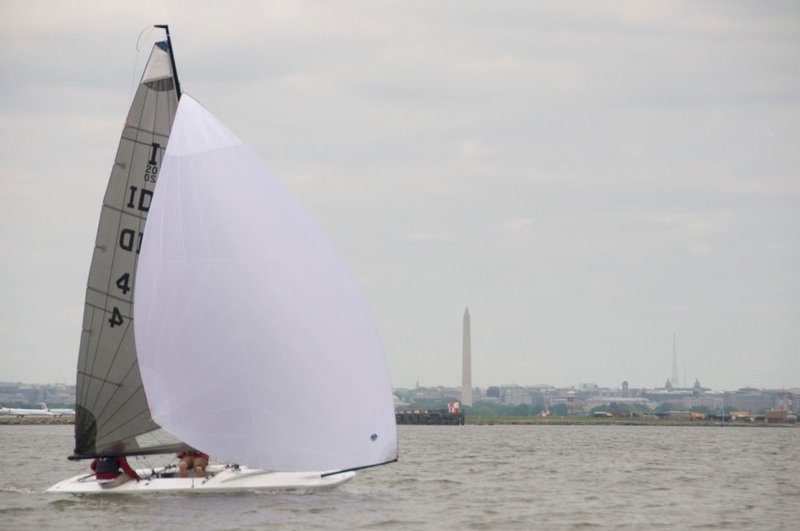 The regatta is April 23 – 24, 2016 at the Washington Sailing Marina in Alexandria, Virginia. 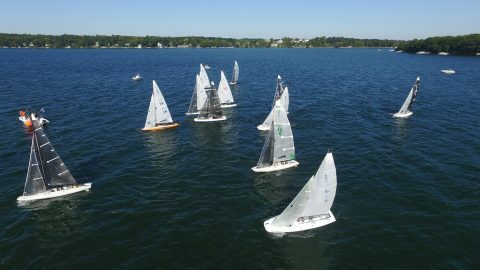 It was a great regatta, Carl, Stew and the rest put on a great event. The facility, venue, and surroundings are all top notch and make for a fun weekend. Friday night we arrived at dusk in some light drizzle and went out to dinner in Old Town. Saturday morning we had some rain, winds ranged from probably 10 to 20 all day, the temperature was good though, we were never cold (which is a good thing for a spring regatta!). Race 1 was on the North course (north of the airport if you’re looking at it on the map) where the washington monument and capital building are both clearly visible. We had some mild carnage with 1 boat having mast failure in a couple places, another boat had an injury, and we lost our halyard up the mast during the final Spinnaker take down. 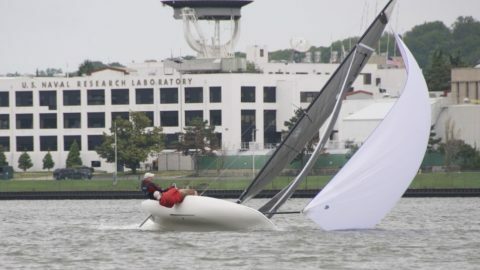 We sailed to shore and tipped the boat over to retrieve our halyard after the race, but race committee exercised an abundance of caution and decided to postpone the 2nd race due to the missing boats. We went in for an hour or so and then regrouped on the south course for 2 more races. 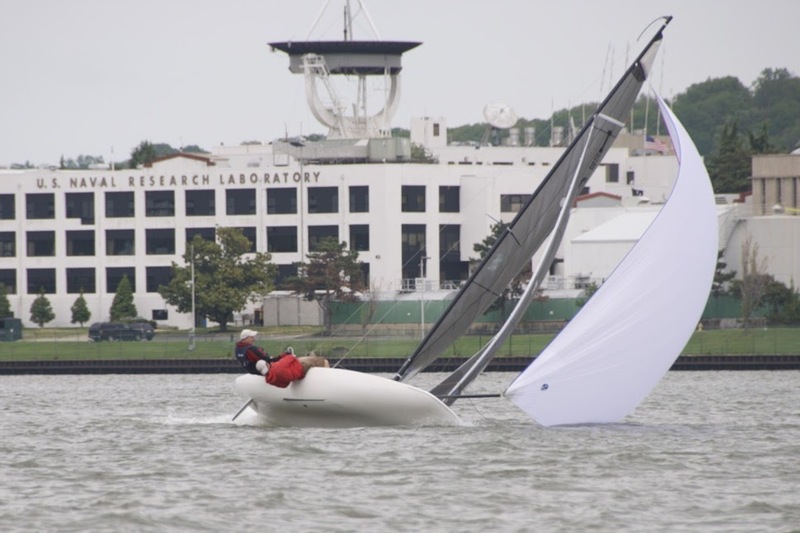 By this time the rain had stopped and we had 2 excellent races in good wind. After racing we had an amazing meal catered by a local BBQ restaurant. Sunday morning we started at 10am on the North course again. Initially winds were good, 10-15mph wind, but by our final lap had died down to glass. We finished that race and called it with 4 total races. All in all, a great time, great people, great venue. I can speak for all the ID boats when I say we will definitely be back.